Hey it’s p. I’m an artist at AMATA K.K. I will be sharing various topics about the fine arts as part of a planned series for this blog. Since there are already a ton of articles about art technique, the industry etc, floating around online, I’ll be picking up topics about things that aren’t talked about that often, such as art theory and history. That’s right. When “Mucha” comes to mind, you’d think,“ Eeverybody knows who he is!”, right? Alphonse Mucha is a respected, world-renowned artist who is an especially popular figure amongst the animation and games industry. I’ll be exploring the art movements that happened in Western Europe around the year 1900, during the time when Mucha was most active as an artist. In 1895, Mucha became an instant star in Paris due to his hugely successful “Poster for Gismonda”. However, this story begins 10 years prior – in 1880s Britain. Beginning in England, this was the time when Western Europe was thriving in the new innovation of the Industrial Revolution. While at first glance, the cheap and standardized industrial products were seen to enrich people’s lives, there was one man who was concerned about this situation. That man was, the artist William Morris. With a strong adoration of the Middle Ages, Morris was also well-known as a fantasy novelist. He rejected what he saw as “cheap but crude mass production” and “a society that loses the joy of creation as people are reduced to as simple factory labor,” insisting on the importance of “old-fashioned craftsmanship carried out by the handwork of individual artisans”. Morris then organized a company, planning to “integrate works of art into people’s livelihood” by allowing things such as furniture and works of art to be infused with “craftsmanship”, to flow into society. People with the same intentions would act in unison in such activities, and an Arts and Crafts Movement – inspired with the ideal of “uniting the fine arts with lifestyle” – would flourish. So moving on with the story. This movement spread widely from England, over to Western Europe and expanding its influence as it adopts the styles of each country. Among them, was the well-known French Art Nouveau; a style that boldy inherits the idea of “re-evaluating the craftsmanship of decorative art”. 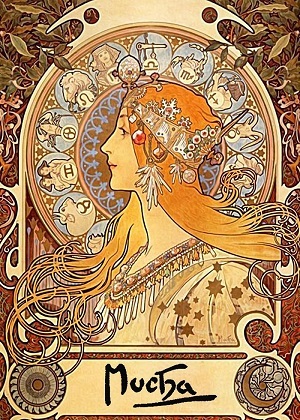 “Mucha” is a name that can be interpreted as synonymous with Art Nouveau, and is seen as one of the most successful figures among those belonging to the movement. Let’s take a look at some examples of his work. Magnificent decoration with plant motifs, reminiscent of medieval fantasy. Daily necessities such as accessories and tableware crafted as works of art. It is the achievement of using the form of commercial art such as posters, and using those works to spread widely throughout the society. “Ah! This is exactly what Morris was aiming for! !” Don’t you think so too? In fact, I personally think that Mucha was a painter who was able to come very close to Morris’ ideals. However, it isn’t as though he adopted a style like this simply inspired by the ideals of the Arts and Crafts movement. Although he did have the pride and wanted to“create a masterpiece that makes an emotional impression on a lot of people,” unlike Morris, Mucha didn’t have much interest in social reform. As evidence of the lack of interest, as soon as he found nationalism in his purpose for living, Mucha devoted the latter half of his life to painting for his home country, and backed away from the aforementioned styles and commercial activities. There is no doubt that most of the brilliant achievements responsible for his reputation were his successes in commercial art. Given that fact, it is interesting to consider that in the background of Mucha’s success, is the idea of “the unity of fine arts and lifestyle”. Morris’ movement to fill people’s daily lives with beauty, and the French society inspired by that movement. And so, the tremendously influential Alphonse Mucha and Art Nouveau of that era were subsequently bathed in fairly harsh criticism, and soon fell into decline. 100 years after their golden age, Mucha and Art Nouveau are still hugely popular in Japan. What kinds of criticisms were raised, and why did it fall into decline? Let’s save that conversation for next time. **Kyo-Yuzen: a Japanese technique of painting dye directly onto cloth. It is a common technique used for dyeing kimonos and coats.